These are impressive for practice and do give an authentic cymbal feel. Maybe too quiet for gigging. Until recently the concept of cymbals made specifically for drastically reduced volume properties would have seemed as likely as a chocolate teapot. However, this is no drummer's joke, but a serious development. Zildjian says its new 'L' models would be ideal for any low noise-level drumming application such as practice, tuition or even a quiet gig. Here we have the LV468 boxed set for review (one of the three sets available), comprising 18" crash-ride, 16" crash and a pair of 14" hi-hats. Each cymbal here is specifically designed to provide the experience of playing a real cymbal without the associated noise levels. In fact, they are said to be around 80 percent quieter than your average cymbal. During scientific tests using consistent strikes, a conventional cymbal peaked at around 123dB whereas the new model only reached 83dB - a dramatic reduction. Those with a keen eye will notice the new Ls look remarkably similar to Zildjian's Acoustic Electric Gen16s. This is primarily due to the "state-of-the-art" sound-reducing technology of the perforations spanning the entire cymbal surface. This essentially reduces the mass, resulting in vastly reduced sound output. The new models are not electronic but purely acoustic, and instead of B8 bronze (as in the Buffed Bronze Gen16s), Zildjian experimented with several other alloys to find one which would meet the required low volume levels, but would still feel like you were playing "a real Zildjian". Stamped into the top of each cymbal are fine 'lathe' lines for aesthetics (rather than tone grooves), while the underside remains completely flat. Also stamped in at the edge is another reminder that the new cymbals were developed off the back of the Gen16s, with a serial prefixed by the letters 'AE'. The texture of the bronze hue finish is reminiscent of powder coating, giving the matte surface a slightly raised sandpaper coarseness. This surface also helps to further reduce and dampen any of the higher cymbal frequencies produced. As the four cymbals are pulled from their individual plastic wallets, we find that it's instinctive to check each one out for weight - making comparisons against our usual wares. As expected (from the mass of perforations), these are lighter but, surprisingly, not all that significantly. 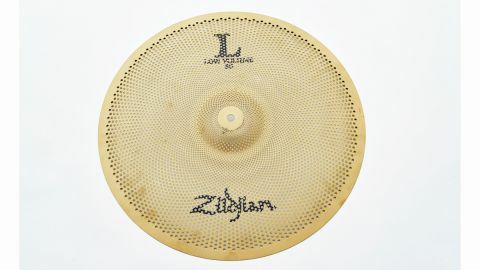 There is no designation imprinted on of any of the models - here we have screened in black ink, simply 'L', '80' 'LOW VOLUME' and, of course, the familiar Zildjian logo. The hi-hat cymbals are exactly the same weight as each other - so, I'm assuming that either can/may be used for the top or bottom - and onto the stand they go. For practice we would normally use some rubber dampening pads on my conventional cymbals and use them in conjunction with similar pads on my gig kit or with a small practice kit fitted with mesh heads. As we begin to 'introduce' each of the new cymbals to our mesh set-up, there's little adaptation to our playing style necessary, no compromising with lighter sticks either -we are using exactly the same models as when we go out gigging. Our initial thoughts are that the sound from the wooden stick tips striking the surface appears louder than the resulting ring of the cymbal. And it's a little odd becoming accustomed to hitting a cymbal (hard! ), without causing those around you to run for cover or, at least blink - in this respect playing with these is a totally new experience! The partnership of mesh heads and these cymbals proves to be a winning combination and you soon forget that you are playing at such a low volume level. After hitting around for a few minutes it suddenly dawns on us that we are now having the same playing experience but without the associated noise - a revelation perhaps? Striking at the bell of the 18" doesn't quite have the dramatic effect that you would expect or usually achieve. However, it does sound similar but, of course, at a much lower volume. Now we are fully familiar with the various cymbal tones, here we are able to get a series of wholly acceptable 'ride' patterns as the cymbal raises and drops rapidly - this is perhaps the only dramatic aspect as the sound tails off so quickly with little overtone. When applying the hi-hat pedal, the cymbals produce a definite audible 'chick' and come with all the features of conventional models including half open, should you decide to rock it up a little during practice. These are impressive and, as far as metal practice cymbals go, we think we can say they are totally unique. The crash raises instantly and, as with all the cymbals here, disappears into the air just as quickly, without any detectable overtone. As each strike takes place, the pattern of the swirling perforation holes on this and the ride, shaking dramatically, is quite mesmerising. Initially though we were a little concerned that the perforation holes would cause the stick tips to wear prematurely - having played for a good few hours, these and any other fears were proven unfounded.